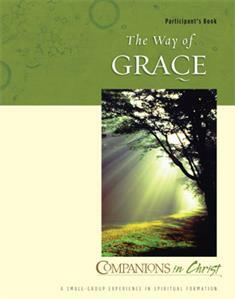 The Way of Grace Leader's Guide is also available. Grace is a gift. Even before we recognize its need in our lives, God extends us favor. This 9-week study in the Companions in Christ series explores the Gospel of John and how divine grace is at work in our lives today, just as it was in the lives of biblical characters 2,000 years ago. "God's grace comes to us in the distinctive shape of our personal histories, needs, and possibilities," Indermark writes. "Yet divine grace also reveals the depths of what we share across all boundaries of time and place." Participants in this small-group study will explore the central stories of John, focusing on people who discovered God's grace through their encounters with Jesus. This is more than a survey of the biblical stories of Andrew, Simon, Philip, and Nathaniel; Nicodemus; the Samaritan woman; the lame man; the woman caught in adultery; the blind man; Mary and Martha; and Simon Peter. The Way of Grace is a transforming interaction with the events and the characters, a chance to identify with what God provided for these people — a provision they could never achieve for themselves. Groups new to Companions in Christ or to spiritual formation will find The Way of Grace to be a good introductory course. If you long to open your heart to a deeper knowing of God's grace — to recognize the "soul's deep compass steering us Godward," this is the study for you.